After rejection, I requested the MRCP exam controller to postpone my exam in November 2015 in order to have time to reapply for the visa. I reapplied and attached an explanation letter from my husband explaining the origins of all the deposits other than salary. He also attached all the evidences to support his claims. Also, this time my husband provided a letter from employer explaining about the vacation salary (Largest deposit). Yesterday, I got rejection again and this time the reason was that the exam is available regionally and I had to provide evidence that I applied before applying for the UK. Also, they said that I didn't attach IELTS result despite of the fact that I included the copy of IELTS* (8 band each). Point to be noted is that the visa officer was different this time and he/she didn't comment on the previous issues of providence of funds so I assume he/she is satisfied with the provided explanation/evidences. Now, I would like to apply for the third time as I still have time provided I apply on priority basis (I applied both time on priority service). I can provide them the evidence that I applied for regional exam back in June 2015 but was not selected due to the limited seats and can reattach the IELTS, original this time. As all assessments are conducted in English, the Royal Colleges of Physicians advise candidates that in order to be sufficiently prepared to sit the MRCP(UK) Diploma, their English language ability should be equivalent to International English Language Testing System (IELTS) Level 7.5. However, candidates do not need to have taken IELTS or any other language examination, to sit the MRCP(UK) Diploma. Interestingly, visa officer skipped the last part. Anyhow, I got 8 in IELTS and also attached, I don't know how they missed it. So, I would appreciate if you can advise the following. Is it wise to reapply for third time by providing the required evidence. A friend of mine told me that it is useless as their comments are baseless and they simply don't want to issue me the visa. I don't think that could be the case, right? I know I will look desperate applying third time in the row. But, I would like to mention that my desperation is because I am studying for 8-10 hours daily for the past 3 months to prepare for the exam. Exam fee GBP 650 is non refundable and if I take this exam regionally, it would cost me same if not more because exam fee is double in international centers. Also, taking MRCP at international centers is difficult because of preference for local candidates. I am shortening my visit this time to just 1 week as I am no longer interested in sight seeing. Would that be a problem. I checked there is an option for lodging complaint. Is it advisable? Why didn't the visa officer mention the second refusal comments in first refusal letter so that I could have tried to satisfy him in one go. I am afraid that he/she will now come up with some new comments. Isn't it unfair? 1- Is it wise to reapply for third time by providing the required evidence. A friend of mine told me that it is useless as their comments are baseless and they simply dont want to issue me the visa. I dont think that could be the case, Right? No, it is not wise to make a fresh application at this time without supervision. After two back-to-back refusals, it should be clear that your situation is not going to be improved by using the internet for visa advice or consulting with friends. Your assumption that they do not want to issue you a visa is wrong. They will issue your visa when you qualify. We have about 30+ refusal notices in our archives here and not one of them indicates a whimsical or prejudiced refusal on the ECO's part. To the contrary, all of them were predictable beforehand and well grounded in the rules. 2- I know I will look desperate applying third time in the row. But, i would like to mention that my desperation is because I am studying for 8-10 hours daily for the past 3 months to prepare for the exam. Exam fee GBP 650 is non refundable and if I take this exam regionally, it would cost me same if not more because exam fee is double in international centers. Also, taking MRCP at international centers is difficult because of preference for local candidates. This isn't really a question, but yes, applying for a third time without supervision is adventurous because (apparently) you do not understand how to make a successful application. But worse, if they see that you are doing the same thing over and over, you may attract a ban under Paragraph 320 (making frivolous applications). That's a bad thing. 3- I am shortening my visit this time to just 1 week as I am no longer interested in sight seeing. Would that be a problem. This isn't going to work. Your refusal notice points out that they got you on V 4.2 (a) and (c). It means they think you are not transparent about your intentions and that you will abscond and go underground. If that's your strategy, you only need a visa that lasts for 1 minute! Just to clear controls at the airport and then disappear. So changing the length of your proposed visit to a shorter period is something that will not make them think you are being more genuine. Your proposed length of stay is irrelevant at this point. 4- I checked there is an option for lodging complaint. Is it advisable? You can complain to them if you think it's justified. They take complaints very seriously because they know the system is fragile and can break sometimes. To help make the complaint resolution easier, they have segregated the complaints team from the ECO's so that one never knows what the other is doing. They do this to avoid any suggestion that the applicant might be vulnerable to bureaucratic vengeance. And there has been no viable reports of bureaucratic vengeance in at least 18 years. But, the 'double edge' is that it will not get you to the UK until you qualify with a proper application. If they decide that the ECO's decision was low quality they tell the ECM to watch him/her more carefully. If you have a really good complaint, they will credit your account with a gratis application (i.e., you don't have to pay the 83 pounds fee), but that happens less than 100 times a year globally. 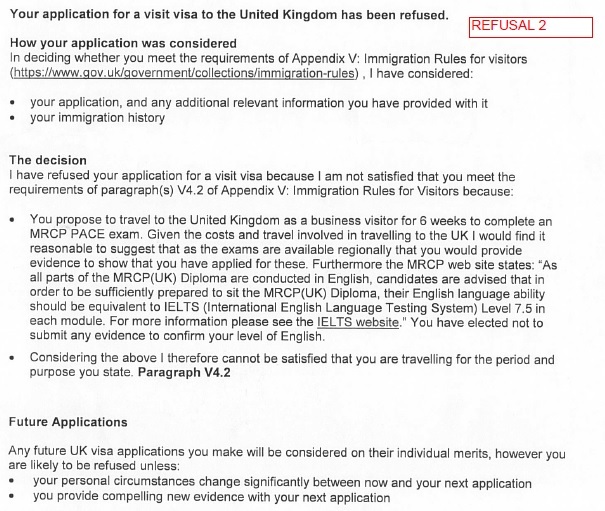 5- Why didnt the visa officer mention the second refusal comments in first refusal letter so that I could have tried to satisfy him in one go. I am afraid that he/she will now come up with some new comments. Isnt it unfair? When the ECO starts to examine the evidence, he/she will stop when it becomes clear that an applicant does not qualify and seeing more evidence is a waste of time. This is because their quota provides only about 4 minutes per applicant and they need to move on to the next applicant. Sometimes applicants get upset when their refusal notice indicates that the ECO "ignored" their stuff, but these people are missing the point. So to answer your question, the first refusal didn't address every possible thing you should have done, that's what a solicitor does. And their role is not to give you legal advice, all they do is approve or refuse and pass it to the correspondence person. Maybe this is unfair, but they will point to their statistics showing 90+% of applications are successful, so the majority of people are satisfied. 6- Any other useful advises. I would not submit another application by yourself; it's clear that using the internet and friends does not work for you. The best course of action (IMHO) is to instruct a solicitor of fairly high standing with a practice specialty in MRCP examinations and entry clearance refusals (Pat Saini and Sophie Barrett-Brown being prime examples). My best guess at getting a UK solicitor to unsnarl this and get you in to the UK for your examination would run about GBP 3,500 - 4,000, but considering that you have back-to-back refusals along with weak personal circumstances, and a borderline premise in the first instance, that's not an unreasonable estimate. On the bright side, if they look at your stuff and decide that they can not help you succeed, they will not take you under client care so you don't have to spend the money. I am not a UK citizen, however my advice would be to do another application, possibly with the help of others. Like you said, they ignored some included documents and next time they might actually pay attention. Perhaps you can figure out what could be the cause they ignored some information. Is there simply too much or is it not structured enough? What your friend is saying doesn't make sense to me, these people are bound by rules and laws and they cannot just decide to dislike you. That goes for the nation too, they don't just reject people because they don't like them. The only thing I couldn't make out for sure (am I overlooking it?) is if you provided all the documents about the exams you are going to take and the location where you will take them. Not the answer you're looking for? 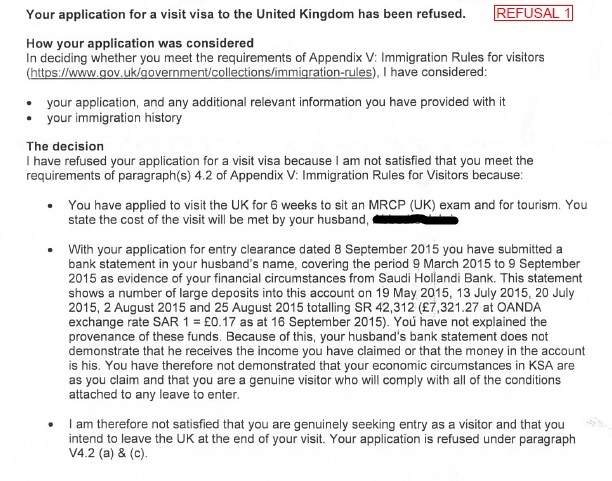 Browse other questions tagged uk visa-refusals pakistani-citizens saudi-arabia or ask your own question. UK visit visa refused for alleged lack of funds. How can I remedy the situation in the future?